Shortbread is one of my favorite treats during the Holiday season. And while all that buttery goodness seems like a lot of work, it couldn't be easier to make. 1 c. unsalted butter, softened and cut into cubes. 1. Cream the butter using a stand mixer, hand mixer or go "old school" with a large wooden spoon. Add the vanilla at this time, if you choose to do so. 2. Sift together the dry ingredients. No sifter? No problem. 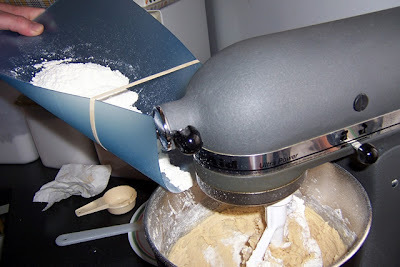 Just combine the dry ingredients in a mixing bowl with a wire whisk. It'll distribute the ingredients evenly, and help separate the tiny bits. Trust me, it makes adding the dry ingredients a WHOLE lot easier, and gives you far more control. 4. Once the dry ingredients are incorporated, turn up the mixer to medium for about 20 seconds for a good blend. Remove the dough from the workbowl, place in a ziptop bag, and refrigerate for about an 1/2 hour. This will firm up the butter that may have become too soft, and keep it in tiny pockets through your dough (think flaky pie crust), and will allow the flour to hydrate a bit, and leave you with a more cohesive dough. 5. 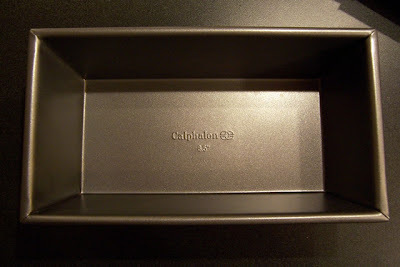 Now preheat your oven to 325°F, and dig out two 8-1/2" loaf pans, or one 9"x9" square pan. Due to the amount of butter in the dough, you won't need to grease the pans. Trust me. 6. Pull your dough from the fridge, and either divide in half for loaf pans, or leave whole for a square pan. Gently form the dough in the rough shape of the pan(s) you are using. If the dough gets too soft, just pop it back in the fridge for a few minutes to firm up. 7. Place the dough in your pan(s) and flatten it out to a uniform-ish thickness. Using a dinner fork, carefully create "perf" lines to divide the dough into an equal number of bars. I found that eight bars per loaf pan makes a good size. Then, take a single chopstick and dock each bar a few times. Docking the dough allows steam to escape while baking. And it makes it look cool. Check out the nifty diagram. I trust you can figure out the square pan math. 8. Once your oven has hit temperature (I'll pretend you checked your after-market oven thermometer to make sure your oven isn't lying to you), bake your shortbread for 25-30 minutes, or until the edges and top start to turn a nice golden brown. 9. When done, remove the pans from the oven, and allow to cool for 10 minutes BEFORE de-panning. This will allow the the shortbread to set up a bit, making it easier to remove it from the pan in one piece. 10. Now the fun part. If you are using loaf pans, and happen to have a empty third loaf pan available, gently nest the empty loaf pan in one of the full pans, flip them over and drop onto a cutting board or counter top from above an inch above. This should jar the shortbread loose. You could also fold up a clean kitchen towel, hold in place over the shortbread with your hand, flip and rap the edge of the pan on the counter. Which ever way works for you. Once out of the pan, flip the shortbread back onto a cutting board. 11. Remember those perf lines you made with the fork? 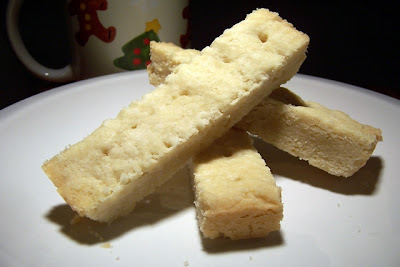 While the shortbread is still warm, take a large knife and cut the bars apart along the perf lines. Easy, wasn't it? Just be sure to cut them apart while still warm or they will crumble. Place the bars on a cooling rack to cool completely. 12. Once cool, move the shortbread to an airtight container, and *try* not to touch it for a few days. These few days will allow the shortbread to age a bit, giving it a nice mellow flavor, and smooth texture. But don't let them age too long... again, trust me, rancid shortbread is not recommended.